'Tis the season to CRACK THE CODE! 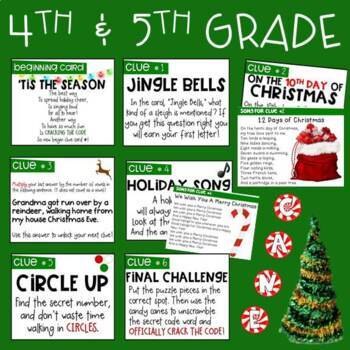 This December challenge your students with a December/Holiday/Christmas themed CRACK THE CODE! Your students will be challenged as they use their creativity, communication skills, and collaboration abilities in order to complete this breakout! Have fun as your students participate in what is sure to be the most memorable breakout of the year! 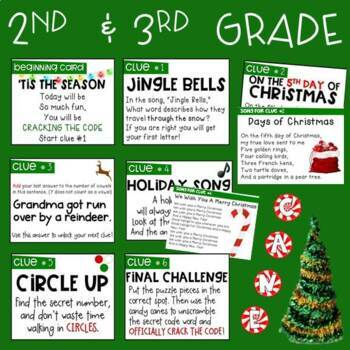 Breakouts are very similar to scavenger hunts where students need to solve different puzzles/clues in order to get a prize. 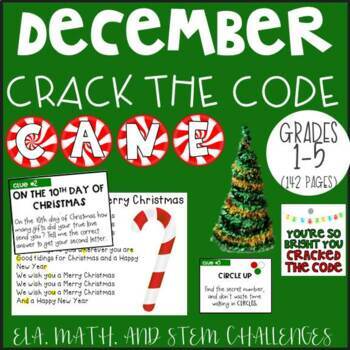 In this break, students will be reading passages, solving math problems, using a letter decoder to decode secret messages, participating in a stem activity, and collecting letter pieces throughout the breakout in order to unscramble the final secret code word CANE. There is a recording sheet included which students can use to show their work for each question and submit at the end! The only additional supplies you will need in addition to printing this PDF is red, green, and white paper, pipe cleaners to construct a holiday tree, and OPTIONAL black light and invisible ink! This Crack the Code is for Grades 1st-5th with multiple versions of clues to meet the needs of all learners. 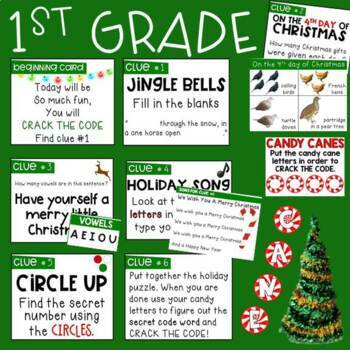 For grades 1st-2nd you can do this whole class as a Crack the Code or you could use each clue card as a CENTER. Please feel free to reach out if you have any questions or need a modification. Thanks!